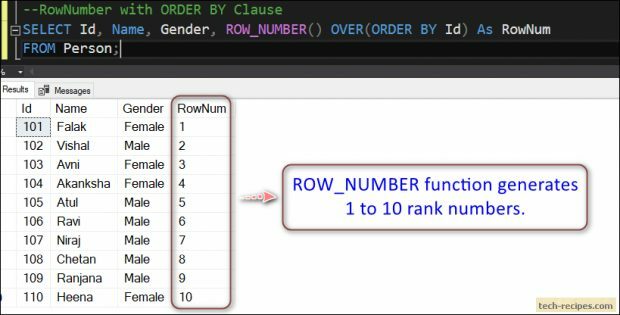 ROW_NUMBER, analytic and ranking function in SQL Server. Assigns sequence number to table rows in incrementing integer values starting at 1 for the first row. Assigned row numbers act as temporary value to result set not persistent. ROW_NUMBER function works with ORDER BY clause to sort the rows in the defined order then numbers the query result set. For example, we have 10 rows is a table, and using ROW_NUMBER function with ORDER BY clause assigns numbers starting at 1 and ending with 10. Likewise, ROW_NUMBER function also used along with PARTITION BY clause to create a separate window of rows based on conditions. For instance, we have 10 rows in Person table, 5 Males and 6 Females. Using ROW_NUMBER function and PARTITION BY Gender column will assign 1 to 5 numbers to Males and 1 to 6 numbers to Females partition. PARTITION BY - Optional, seperate rows into different partitions and applies ROW_NUMBER function to each partition. ORDER BY - Sorts the row in a defined order and assigns number to query result set. 1.Assigns incrementing integer values starting at 1. 2.Subsequent rows will get the next higher value, ideally previous row number value + 1. 3.Assigned numbers are temporary not persistent, for persistent number use IDENTITY and SEQUENCE objects. 4.PARTITION BY clause used to create a window of rows which is optional. 5.Multiple columns can be used with ROW_NUMBER and PARTITION BY to create windows and assigning numbers to each window starting at 1. 6.No parameters allowed with ROW_NUMBER. Let’s demonstrate ROW_NUMBER function with helpful and practical examples. Following query uses ROW_NUMBER function with ORDER BY Clause on the ID column. RowNum, a derived column name, an alias for the output of ROW_NUMBER function. Sorting the rows by ID column and assigning a number to each row starting with 1 and increasing the value for subsequence rows. In below query, reusing the dbo.Person table. Here, ROW_NUMBER function used along with PARTITION BY and ORDER BY clause. First, creating two partition windows based on the Gender column. In total we have 11 rows, thus First partition window created for Female having 4 rows. ROW_NUMBER function is applied to each row in Female partition, thus assigning a number from 1 to 4. Second partition window is created for Male having 6 rows. ROW_NUMBER function applied to each row in Male partition, assigning a number from 1 to 6. In summary, ROW_NUMBER function reset the number for each partition and starts at 1 when crossing the partition boundary. 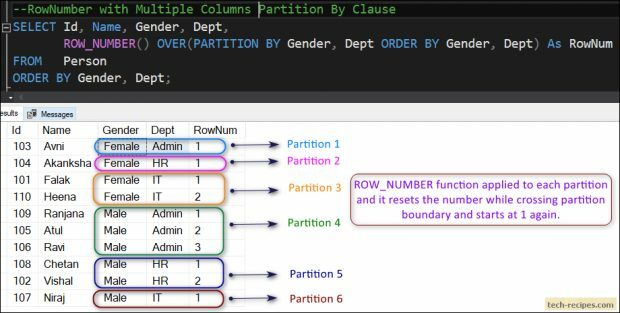 Following query demonstrates the use of multiple columns in PARTITION BY conjunction with ORDER BY. Added Dept column to dbo.Person table. PARTITION BY involves Gender and Dept column, thus we have different partition based on them. Notice that, each gender and dept is numbered by ROW_NUMBER function. Crossing the partition boundary ROW_NUMBER resets the value and start at 1. In the following query, using PARTITION BY on duplicated rows and assigning them a number. Each duplicated row partition will get row number starting at 1. Furthermore, using Common table expression (CTE) to fetch only rows having RowNum = 1, thus removing duplicate values and selecting a single instance of each row. To summarize, we have learned to use ROW_NUMBER function with ORDER BY clause and PARTITION BY to learn to rank the rows based on conditions. Using ROW_NUMBER with CTEs to find duplicate values. If you like this post you may read through Tech-Recipes Database archive posts to learn some more useful stuff.